In 1950, Raimond Gaita emigrated with his Romanian father and German mother to Victoria, Australia. His father, Romulus Gaita, was a skilled blacksmith, but was sent to a migrant labour camp to work on the construction of the Cairn Curran reservoir. Raimond and his mother were able to join him only later when he began to share a desolate nearby farm called Frogmore. It had no electricity and no running water and barely sheltered them from the elements. Raimond’s mother was promiscuous, suffered mental illness, and left and returned several times. Eventually she committed suicide. Despite these terrible circumstances, this is a moving and unsentimental memoir of post-war European immigration to Australia, set in the bleak but beautiful landscape of Central Victoria. Raimond Gaita emerged from this dreadful background to achieve a university degree in Melbourne, a Ph.D. from the University of Leeds, U.K., and to become a Professor of Moral Philosophy at King’s College, London, and later the Melbourne Law School. How on earth he managed it must, to a considerable extent, be down to the close bond with his father who, despite mental illness of his own, maintained a consistent, highly principled moral stance throughout his difficult life. 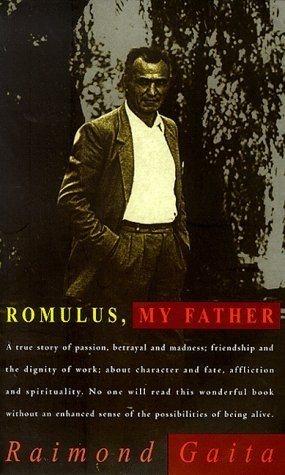 This is the main theme throughout the book: Romulus Gaita’s approach to love, honesty, friendship, family, relationships, migrant culture, landscape, work (he eventually established a business making and selling wrought iron furniture), wealth, self-image, suffering, violence, loyalty and forgiveness. It is, it seems, a philosopher’s examination of his father’s influence upon his own beliefs and thinking. It is also a remarkable and inspiring story. I was motivated to read Romulus My Father by a piece in Helen Garner’s Everywhere I Look, in which she discusses people and events in the book with Raimond as he shows her around the sites of his childhood. She describes the book as having changed the quality of Australia’s literary air. It is not hard to see why.